Context Neoadjuvant chemotherapy is increasingly used in borderline resectable and locally advanced pancreatic cancer to facilitate surgical resection. Objective To compare progression free survival and overall survival in patients receiving neoadjuvant FOLFIRINOX with those receiving gemcitabine/abraxane. Design Retrospective cohort study. Setting University of Colorado Hospital from 2012-2016. Participants Patients with pancreatic adenocarcinoma. Interventions Neoadjuvant FOLFIRINOX or gemcitabine/abraxane. Outcome Measures Perioperative outcomes, progression free survival, and overall survival were compared between groups. A multivariate Cox proportional hazard model was applied to evaluate survival outcomes. Results We identified 120 patients: 83 (69.2%) FOLFIRINOX and 37 (30.8%) gemcitabine/abraxane. The FOLIFRINOX group was younger and had a lower ECOG performance status (p<0.05). Patients in the FOLFIRINOX group were more likely to undergo surgical resection compared to gemcitabine/abraxane (66.3% vs. 32.4%, p=0.002). Among all patients, median follow up was 16.9 months and FOLFIRINOX was associated with improved PFS (15.3 vs. 8.2 months, p=0.006), but not overall survival (23.5 vs. 18.7 months, p=0.228). In these patients, insulin-dependent diabetes was associated with a worse progression free survival and overall survival and surgical resection was protective. 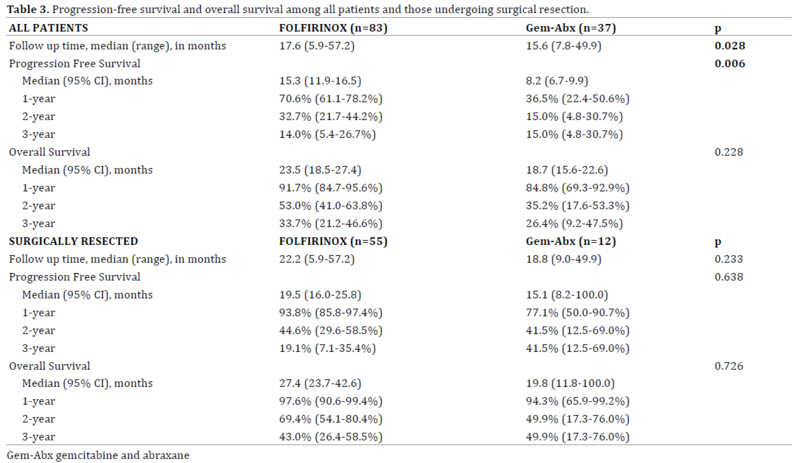 Among surgically resected patients, median follow up was 21.1 months and there was no difference in progression free survival (19.5 vs. 15.1 months) or overall survival (27.4 vs. 19.8 months) between the FOLFIRINOX and gemcitabine/abraxane groups, respectively (p>0.05). Insulin-dependent diabetes and a poor-to-moderate pathologic response was associated with worse progression free survival and overall survival. Conclusion Neoadjuvant FOLFIRINOX may improve progression free survival by increasing the proportion of patients undergoing surgical resection. Improved understanding of the role for selection bias and longer follow up are needed to better define the impact of neoadjuvant FOLFIRINOX on overall survival. The incidence of pancreatic cancer in the United States is increasing and is the fourth leading cause of cancer-related deaths. It is estimated that greater than 43,000 people in United States will die from pancreatic cancer in the year 2017 . In the absence of metastatic disease, the National Comprehensive Cancer Network (NCCN) guidelines classify pancreatic adenocarcinoma as resectable, borderline resectable (BR), or locally advanced pancreatic cancer (LAPC) based upon tumor location within the pancreas and extent of arterial and venous involvement . Although a surgery-first approach is indicated in the 10-15% of patients presenting with potentially resectable disease, NCCN guidelines recommend neoadjuvant therapy in the 40% of patients presenting with BR or LAPC . Neoadjuvant therapy in patients with BR or LAPC may offer several potential advantages. First, neoadjuvant therapy increases the proportion of patients with resectable disease receiving multimodality therapy. Second, treating the local tumor in patients with BR and LAPC may reduce tumor volume and downstage tumors enabling surgical resection with a lower risk of an R1 resection. Third, neoadjuvant chemotherapy may also allow earlier treatment of radiographically occult micrometastasis. Lastly, neoadjuvant treatment may identify patients with favorable cancer biology that have the greatest benefit from surgical resection [2, 4]. Despite the known advantages of neoadjuvant therapy in patients with BR and LAPC, the optimal neoadjuvant regimen is controversial. 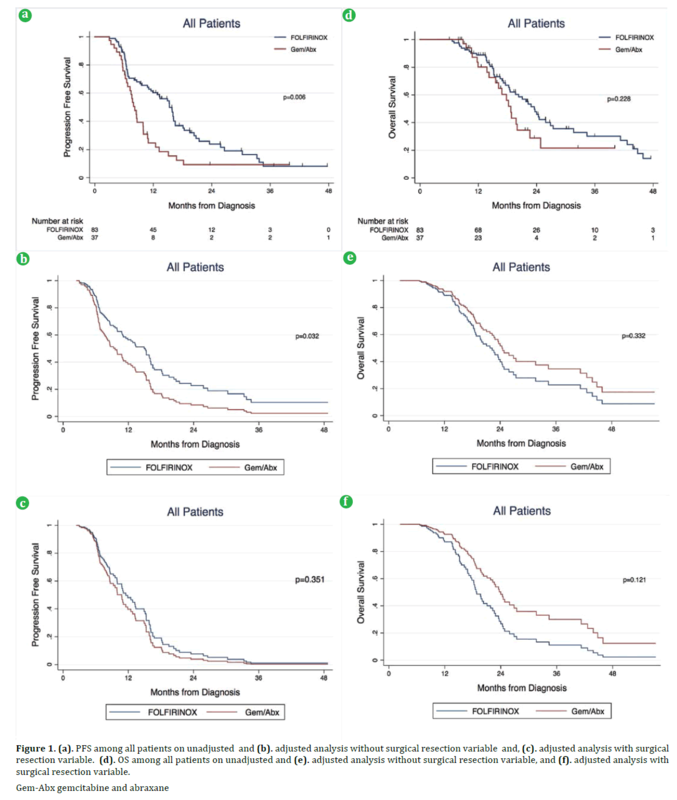 The objective of this study is to compare the proportion of patients that undergoing surgical resection and survival outcomes in patients with pancreatic adenocarcinoma receiving neoadjuvant FOLFIRINOX to those receiving neoadjuvant gemcitabine/abraxane (Gem/Abx). We retrospectively identified all patients that were evaluated at the University of Colorado Hospital for pancreatic adenocarcinoma between June 2012 to December 2016 from a prospectively maintained database using REDCap. Only patients with biopsy proven BR or LAPC adenocarcinoma defined by the NCCN  receiving neoadjuvant FOLFIRINOX or gemcitabine/abraxane were included. The neoadjuvant therapy regimen selected for each patient was based upon a general consensus by the pancreatic and biliary multidisciplinary team. A typical cycle of FOLIFRINOX consists of oxaliplatin, 85 mg/ m2; irinotecan, 180 mg/m2; leucovorin, 400 mg/m2; and 5-FU, 400 mg/m2 bolus followed by 2400 mg/m2 46-hour continuous infusion, once every two weeks. A typical cycle of gemcitabine/abraxane consists of gemcitabine, 1000 mg/m2, combined with abraxane, 125 mg/m2, administered on days 1, 8, and 15 of a 28-day cycle. In general, patients in the neoadjuvant FOLIFIRNOX group typically completed 2 cycles (4 treatments) and patients in the Gem/Abx group completed 2 cycles (6 treatments). 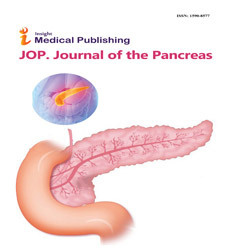 Following completion of neoadjuvant chemotherapy, or in the case of excessive toxicities, soon after interruption of treatment, treatment effects were evaluated by an abdominal multiphasic pancreatic protocol CT or MRI. Radiographic response to neoadjuvant therapy was defined according to Response Evaluation Criteria in Solid Tumors (RECIST) criteria . Patients with LAPC who demonstrated a tumor response or patients with stable BR disease proceeded to curative intent surgical resection or neoadjuvant radiation followed by surgical resection. Patient demographics including age, gender, body mass index (BMI), Eastern Cooperative Oncology Group (ECOG) status , current hypertension requiring medication, and diabetes mellitus were recorded. Patients were classified as having a low serum albumin if albumin was <3.5 g/dL and an elevated baseline creatinine if creatinine >1.1 mg/dL. Carbohydrate antigen 19-9 (CA19-9) (U/mL) on diagnosis was recorded if the total bilirubin at the time of collection was ≤2 mg/dL and CA19-9 were >1 mg/dL. Tumor size (cm), location, and baseline clinical stage was evaluated using CT of the chest, abdomen, and pelvis; MRI of the abdomen and pelvis with chest CT, and/or EUS if available. Clinical stage was defined according to the American Joint Committee on Cancer (AJCC) Cancer Staging Manual, 7th Edition (2010). Medical records were reviewed for the use of neoadjuvant radiation, number of completed cycles, drug-related adverse events requiring hospitalization, dose reduction, or change in chemotherapy regimen, and chemotherapy outcome. Intra-operative outcomes including type of pancreatic resection, need for vein resection, type of vein resection, estimated blood loss (ml), and operative time (minutes) were recorded. Perioperative complications were graded based upon the Accordion Severity Grading System classification . Pathologic reports were reviewed for T-stage, N-stage, tumor size (cm), total number of lymph nodes evaluated, lymphovascular invasion, perineural invasion, and margin status. The patients response to neoadjuvant was recorded and defined according to the College of American Pathologist grading . A positive margin was defined as presence of tumor cells on any surgical specimen margin. Long-term oncologic outcomes including follow up duration (months), progression free survival (PFS), and overall survival (OS) were evaluated. PFS was defined as the duration in months from the date of diagnosis (first abnormal imaging) until the date they either progressed (not surgically resected) or had a local/distant recurrence (surgically resected). OS was defined as the duration in months from the date of diagnosis until the date of death from any cause. The study protocol conforms to the ethical guidelines of the “World Medical Association Declaration of Helsinki – Ethical Principles for Medical Research Involving Human Subjects” adopted by the 18th WMA General Assembly, Helsinki, Finland, June 1964 and amended by the 59th WMA General Assembly, Seoul, South Korea, October 2008, as reflected by a priori approval by the Colorado Multiple Institutional Review Board (Protocol 16-1248). The data was analyzed using Stata 14.1 (Stata Corp, College Station, TX). An intention-to-treat analysis was performed in all patients, including those who remained unresectable or progressed on therapy, according to their initial chemotherapy regimen. A Wilcoxon ranksum (Mann-Whitney) test or student’s t-test were used for continues variables where appropriate and the chisquare test was used for categorical variables. PFS and OS estimates were calculated with the Kaplan-Meier method and compared with log rank test. A multivariable Cox proportional hazard model was applied to estimate hazard ratios (HR) of predictors of PFS and OS. All variables with a p-value of 0.10 or less on univariable analysis were utilized on multivariable analysis. 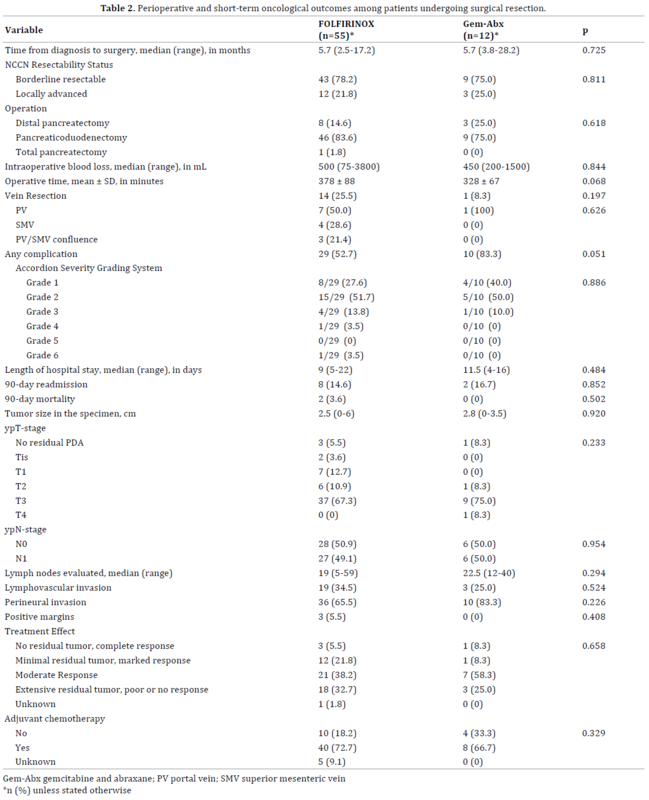 However, a p-value of 0.05 or less on univariable analysis were utilized for patients that underwent surgical resection due to the limited number of events in this group. Additionally, neoadjuvant chemotherapy regimen was included in the multivariable model due to the clinical significance and variable of interest. Surgical resection was included as a time-varying covariate. Statistical significance was defined as a p<0.05. We identified 120 patients with pancreatic adenocarcinoma: 83 (69.2%) patients received neoadjuvant FOLFIRINOX and 37 (30.8%) received neoadjuvant Gem/Abx. Patients in the FOLFIRINOX were younger, more likely to have an ECOG performance status of 0, less likely to have an elevated baseline creatinine, and more likely to have hypertension compared to the Gem/ Abx group (all p<0.05). 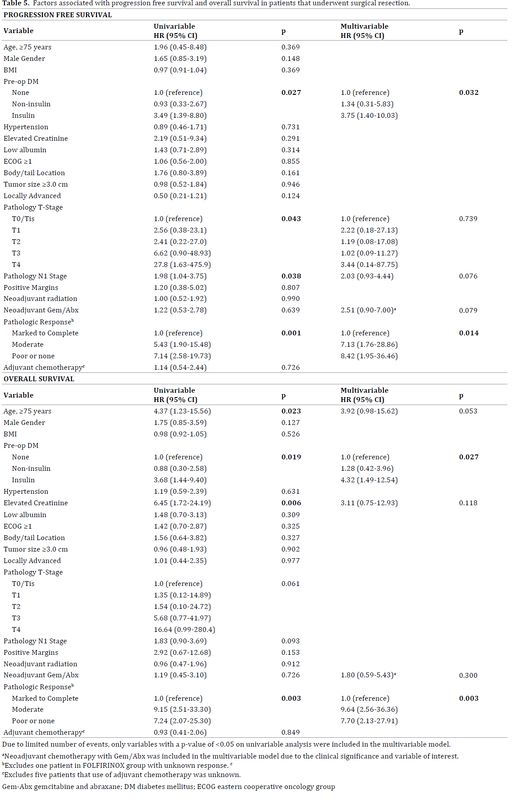 There was no difference in gender, BMI, preoperative diabetes mellitus, or baseline albumin levels between the groups (all p>0.05) (Table 1). Patients in the FOLFIRINOX group were more likely to have tumors in the pancreatic head/uncinate process compared to the Gem/Abx group (p=0.031). There was no difference in NCCN resectability status, baseline CA19-9 levels, tumor size, clinically T-stage, or clinical N-stage (all p>0.05) (Table 1). As expected, patients in the Gem/Abx group completed a greater number of chemotherapy treatments compared to the FOLFIRINOX group (p<0.001), but there was no difference in the percentage of patients completing the treatment as planned, adverse effects requiring dose reduction, hospitalization, or change in chemotherapy regimens, or likelihood of receiving neoadjuvant radiation between the two groups (all p>0.05). Although no patient had a complete radiographic response, only 13.3% of patients progressed on FOLFIRINOX compared to 40.5% in the Gem/Abx group (p=0.001). 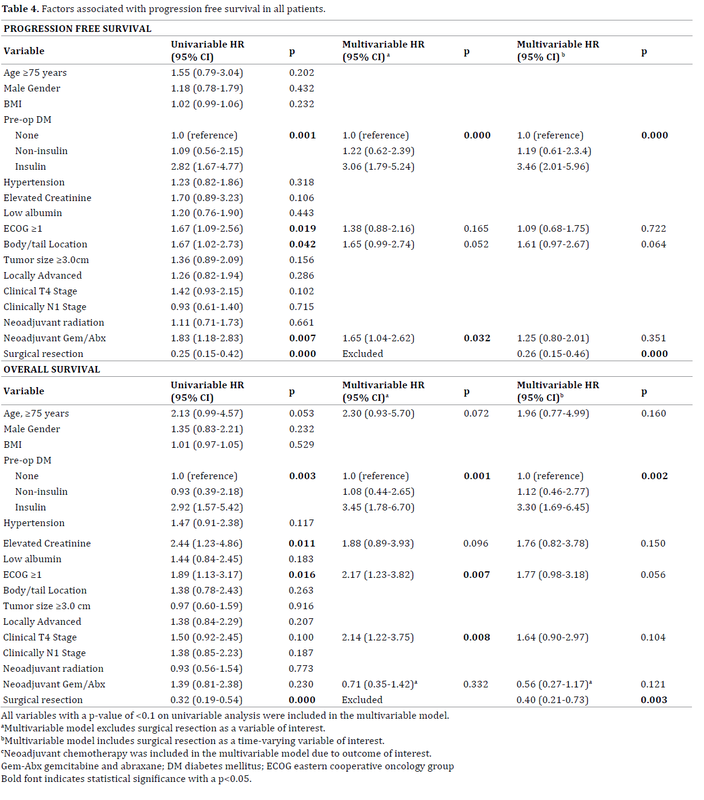 Similarly, a significantly higher percentage of patients in the FOLFIRINOX group were surgically resected compared to the Gem/Abx group (66.3% vs. 32.4%; p=0.002) (Table 1). None of the patients deemed non-surgical candidates were due to poor performance status. There was no difference in the time from diagnosis to surgery, type of operation performed, intraoperative blood loss, operative time, or the proportion of patients requiring vein resection between the groups (all p>0.05). Although there was a trend towards a higher incidence of perioperative complications in the Gem/Abx group compared to the FOLFIRINOX group (83.3% vs. 52.7%; p=0.051), there was no difference in complication severity between the two groups (p=0.886). There was no difference in length of hospital stay, 90-day readmission rates, 90-day mortality, use of adjuvant chemotherapy, T-stage, N-stage, the number of lymph nodes evaluated, lymphovascular/perineural invasion, margin status, or pathologic tumor response between the two groups (all p>0.05) (Table 2). Figure 1. (a). PFS among all patients on unadjusted and (b). adjusted analysis without surgical resection variable and, (c). adjusted analysis with surgical resection variable. (d). OS among all patients on unadjusted and (e). adjusted analysis without surgical resection variable, and (f). adjusted analysis with surgical resection variable. The median follow-up time among surgically resected patients in the FOLFIRINOX group was 22.2 months compared to 15.6 months in the Gem/Abx group (p=0.233). Median PFS (19.5 vs. 15.1 months, respectively) and OS (27.4 vs. 19.8 months, respectively) was similar in the FOLFIRINOX group compared to the Gem/Abx group (both p>0.05) (Table 3, Figure 2a, 2c). 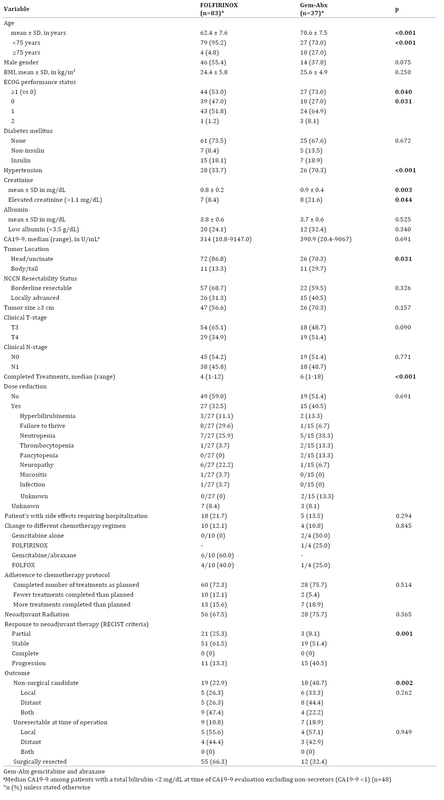 After multivariable adjustment, preoperative insulin dependent diabetes mellitus and a poor-to-moderate pathologic response to neoadjuvant treatment were associated with a worse PFS and OS (both p<0.05) (Table 5, Figure 2b, 2d). Figure 2. (a). 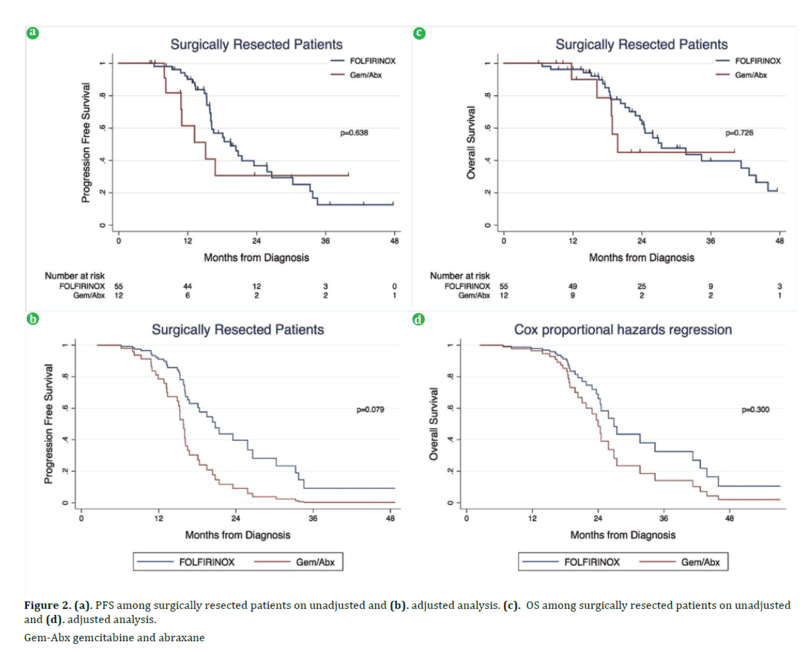 PFS among surgically resected patients on unadjusted and (b). adjusted analysis. (c). OS among surgically resected patients on unadjusted and (d). adjusted analysis. In this single institutional retrospective study of 120 patients with BR and LAPC, neoadjuvant chemotherapy with FOLFIRINOX was associated with 66% of patients undergoing surgical resection compared to only 32% of patients receiving neoadjuvant Gem/Abx. FOLFIRINOX was associated with improved PFS compared to Gem/ Abx, but not OS. However, this effect was no longer evident after controlling for surgical resection suggesting that FOLFIRINOX may be associated with improved PFS by increasing the proportion of patients that undergo surgical resection. Historically, single agent gemcitabine was considered standard of care in patients with metastatic or locally advanced unresectable pancreatic cancer . Although most combination therapies using gemcitabine failed to improve survival outcomes, the landmark ACCORD-11 trial demonstrated superior response rates (31.6% vs. 9.4%), improved PFS (6.4 vs. 3.3 months), and longer OS (11.1 vs. 6.8 months) in patients with metastatic pancreatic cancer randomized to FOLFIRINOX compared to single agent gemcitabine . Subsequently, the multi-institutional randomized MPACT trial demonstrated significant improvement in both median OS (8.5 vs. 6.7 months) and median PFS (5.5 vs. 3.7 months) in patients with metastatic pancreatic cancer randomized to combination Gem/Abx therapy compared to single agent gemcitabine . Based on these findings and extrapolation of the data to patients with BR and LAPC, the 2017 NCCN guidelines recommend more intensive therapy with FOLFIRINOX or Gem/Abx in patients with good performance status . FOLFIRINOX has been associated with significant adverse effects and concerns about its toxicity limits its use in patients with a poor performance status . At our institution, patients with a poor performance status generally are preferentially given Gem/Abx to minimize adverse effects. Consequently, in this study, patients in the FOLFIRINOX group were younger and more likely to have an ECOG performance status of 0 compared to patients in the Gem/Abx group. Overall, there was no difference in adverse effects between the two groups. Interestingly, patients undergoing surgical resection in the Gem/Abx group, tended to have more complications than the FOLFIRINOX group and is likely related to their poor performance status at baseline. However, there was no difference in complication severity, length of hospital stay, 90-day readmission, or 90-day mortality between the groups. Prior studies suggest that the rate of progression on FOLFIRINOX in patients with LAPC based on the RECIST criteria ranges from 0-17% [12, 13, 14]. However, the rate of progression in patients with non-metastatic disease receiving neoadjuvant Gem/Abx remains unknown. In the present study, patients in the FOLFIRINOX group were less likely to progress on chemotherapy (13.3% vs. 40.5%) and more likely to undergo surgical resection compared to the Gem/Abx group (66.3% vs. 32.4%). Additionally, PFS was significantly improved in the FOLFIRINOX group compared to the Gem/Abx group on adjusted analysis. However, after including surgical resection as a variable in the model, Gem/ Abx was no longer associated with PFS. These findings suggest that neoadjuvant FOLFIRINOX may be associated with improved PFS by increasing the proportion of patients undergoing surgical resection. Conversely, FOLFIRINOX was not associated with improved OS compared to Gem/ Abx and may be secondary to a small sample size and limited follow up. Alternatively, FOLFIRINOX may delay disease progression without necessarily increasing the cure rate of patients with pancreatic cancer. In the present study, there was a significant relationship with preoperative insulin dependent diabetes mellitus and both PFS and OS. Previous studies have concluded that not only is hyperinsulinemia an independent risk factor for pancreatic cancer [15, 16, 17], but patients with pancreatic cancer and diabetes have a significantly lower OS than those without diabetes [18, 19]. In an in vitro cell model designed to mimic the progression of pancreatic cancer in vivo, Chan et al. found that hyperinsulinemia accelerated the progression of pancreatic cancer via increased RAF1- ERK-dependent cell survival . Although this may be one possible explanation of the increased risk of mortality in patients with preoperative insulin dependent diabetes mellitus, further study is needed. Among patients undergoing surgical resection, the most significant risk factor for a worse PFS and OS was a poor-to-moderate pathologic response to chemotherapy. Previous studies suggested that up to 25% of patients may have a complete pathologic response following neoadjuvant therapy [21, 22, 23, 24]. In the present study, 4 (6%) patients had a complete pathologic response: 3 (5.5%) in the FOLFIRINOX group and 1 (8.3%) in the Gem/Abx group. At a median follow up time of 29 (range 14.7-40.0) months, 3 of these patients are alive without recurrence and 1 died from recurrent disease 27 months following diagnosis. This study does have limitations. This is an observational study which limited data collection variables, particularly in patients referred from outside institutions. Additionally, patients selected for neoadjuvant FOLFIRINOX were younger and have a better performance status and may impact survival outcomes. Lastly, our small sample size and limited follow up may limit the power to detect differences in OS between the two groups. In conclusion, administration of neoadjuvant FOLFIRINOX to patients with BR and LAPC may improve PFS by increasing the proportion of patients undergoing surgical resection. However, increased sample size and longer follow up are necessary to better define the impact of neoadjuvant FOLFIRINOX on overall survival. Additionally, randomized prospective studies are needed to improve understanding of the role for selection bias and identify which patients may benefit from neoadjuvant FOLFIRINOX. The authors thank Dr. Allan Prochazka of the Masters of Science in Clinical Science program at the University of Colorado Denver serving as Brandon Chapman’s committee chair for completion of his degree of Master of Science in Clinical Science. This study was supported by NIH/NCATS Colorado CTSI Grant Number UL1 TR001082. Contents are the authors’ sole responsibility and do not necessarily represent official NIH views. Authors are declared that there is no conflict of Interest. Network NCC. NCCN guidelines version 1.2017. Pancreatic Adenocarcinoma. In. 2017. Ryan DP MH. Initial chemotherapy and radiation for nonmetastatic locally advanced unresectable and borderline resectable exocrine pancreatic cancer. In Goldberg RM AS, Willett CG, Savarese DMF. (ed). Up To Date.